I’m old so I’ve encountered my fair share of dumb ideas. Many of them were my own. I own my stupidity. Why not? It’s hard to hide from it, so you may as well lean into it. And hopefully, learn from it. Do you have any recurring dreams? Or nightmares? I’m not sure if I do or not, but I do sometimes dream about being back in college and falling behind. When I started college I was going into engineering. 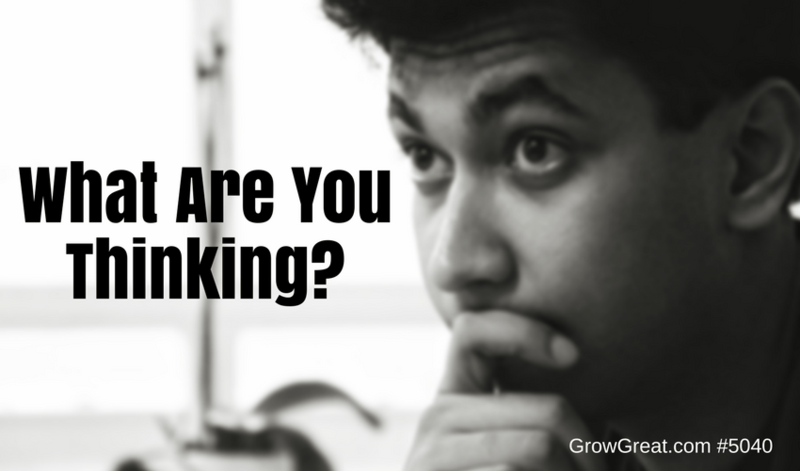 Talk about a major, “What are you thinking?” period of my life! I hated it. Hated every minute of it. I wasn’t wired for it, had no desire to do it, but I was practical to my core. It seems practical. No matter that I had no drive or desire (or capacity) for it. So a semester would begin and I’d go to the first class of some subject. I’d go until I stopped going. I’d just blow it off because I H-A-T-E-D it so. I knew what was going to happen. I was going to avoid going, fall behind and end up dropping the class prior to the “drop” deadline. Dropping was like a lifeline. What else are you going to do when you’re 18, working nearly full-time and trying to go to school full-time and you love your work, but you HATE school? I look back and even though I know what I was thinking, it still prompts me to ask myself, “What were you thinking?” Namely, what was I thinking by even pursuing that education? Answer: I was thinking I should pursue something practical that would earn a decent living. Maybe the more important question, and what today’s show is really about, is — What wasn’t I thinking? I wasn’t thinking long-term. I wasn’t even thinking past college. I never considered, “Do you want to do this for a living after college?” That question alone would have altered my course much earlier. Turns out, after a few years of hating every second of it, I left engineering and went to journalism where I felt like completely different. I loved it. I immersed myself in it. It was more up my alley. No, I still didn’t think I’d enter that field professionally, but it seemed practical from a skill perspective (writing and speaking are always nice skills to develop, I thought). By this point, I really felt – but never talked about and didn’t think too much about it – that business was going to be where I’d spend my life. Turns out I was right! This is just one example I could give you. I’m sure you’ve got a ton of them in your life, too. Times where we just took the wrong path. Made the poorer decision. Didn’t get it quite right. Or didn’t get it even close to right. What were you thinking? If you’re in the throes of it right now, “What ARE you thinking?” Deep down you feel you’re on the wrong path. You picked the wrong fork in the road. Maybe it was a mile back, or maybe it was 1,000 miles back. No matter, you know it’s the wrong course! I talk with lots of business people about a variety of ideas, plans and strategies. My habit is to work toward understanding the answer to that question, “What are they thinking?” As they make these decisions, what’s behind it? What’s driving that choice? What’s driving their conclusion that this is their best option at this moment? Sometimes the talk is about a pivot. Or a new business idea. Or the need to accomplish something (like more sales, or reduction in overhead). While the motive can sometimes be clear, the path chosen doesn’t. And the more I ask and the more they explain what they’re planning to do, or what they hope to do, the more I sometimes sense they question – deep down – whether or not they’re being smart or wise. Business can make fools of us all. I don’t care how brilliant or experienced you are. What should I have thought about that may have altered my course, and helped me make a wiser decision? If I go back to my college days I’d have saved a ton of money, time and spared myself lots of misery if I would have simply thought about some things I frankly never did think about. Not early on at least. I didn’t think about what I was most suited for. I didn’t’ think about what my natural talents were. I didn’t think about what fueled my energy. I didn’t think about how any part of my education would help me build a life I most wanted. I didn’t even think about the life I most wanted. I was only thinking it was something I had to endure and get through. Filled with dread each day. Hating every minute of it. No wonder I was making some pathetic choices. And no wonder I didn’t succeed. I wasn’t thinking about the most important things that would have helped me make better choices. Right now. At this very moment, you’re making some decisions. Choices are happening, either in your head or ones you’ve already put into action, and you don’t feel good about them. You made them based on some thinking, but more importantly, you made them based on some things you neglected to think about. What are you thinking? Better yet, what are NOT thinking?